We provide solutions to keep your office products in line with industry standards and cloud solutions for document management and collaboration. Our hosted Microsoft Exchange lets you accomplish more with a rich, business-class email experience on phones, tablets, desktops, and the web. You can now enjoy enterprise email capabilities with bigger and more reliable mailboxes, experience better collaboration with document sharing and add enhanced archiving, security, and compliance features. We offer a flexible monthly pay as you go version of the latest version of Microsoft Office 365. This package includes Outlook, Excel, Word and Powerpoint. A full installation and configuration service is available. Your most important business asset is data. After all, without customer information, order details or product data, you will not be able to perform any business activities. Imagine partially or even completely losing your business data. It could mean the beginning of the end. At the very least, it would damage your company image. 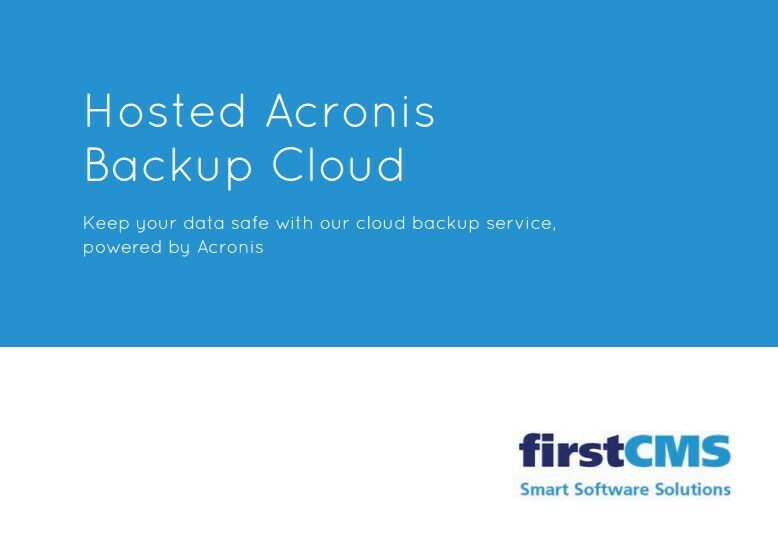 Our hosted Acronis Backup Cloud gives you the peace of mind that comes with the knowledge that your data is safely stored at all times in UK datacentres. Please contact us immediately if you have any concerns about your data backup strategies or protection - we can remote in to your PC immediately or come along and visit your premises to offer guidance and advice on your data backups and system security. Do not wait until it is too late.